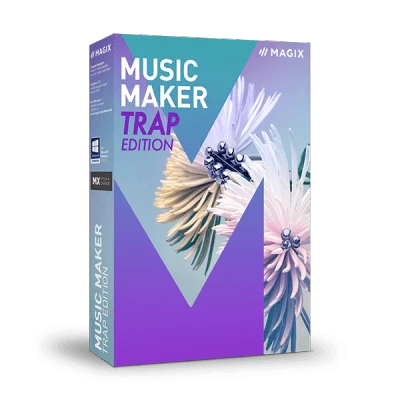 Hard beats, sluggish basses and stuttering hi-hats: With Music Maker Trap Edition, test the limits on your speakers. 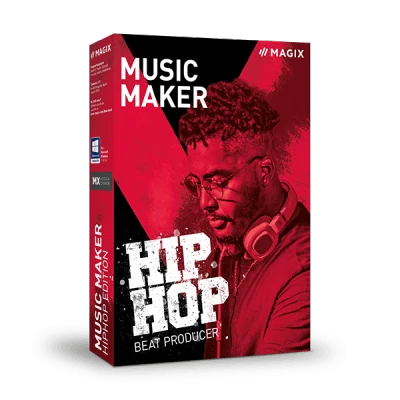 Music Maker has always been one of the most intuitive and easy-to-use tools for beat production. Brrrrrrrrrrrrat! Drop the Bass. And the Vocals. And put down some raps. Trap beats can be easily created in Music Maker using drag & drop! 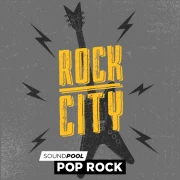 Choose 3 favorites from over 100 soundpools (a pack with thousands of sounds & loops). Surely enough material for a complete trap mix tape! You can combine massive basses with fast hi-hats and booming drops to make a personalized trap beat. How does it work? Just check out our video. It's in the mix: Combine 2,000 sounds & loops from different genres with your selected trap sounds. Included are half time beats, phat 808 sounds, high-pitched synths and more for energetic trap music. The Soundpool, Trap – Future Bass, is composed of various "audio modules". There’s about 18 bass figures, 96 drum samples, 38 synthesizer parts and much more. You can combine these elements freely with each other in order to make professional music - even if you aren't a pro! All sounds & loops have been developed by pro producers and saved in 7 variations. This multiplies your options by seven – and lets you make trap beats with verse, refrain & bridge. Halftime beats, phat 808 sounds and orchestral one-shot samples: Choose one from more than 30 instruments in Music Maker and start your trap production. You can play the software instruments using the keyboard, mouse or MIDI controller. Perfect for trap beats with hip-hop future bass flair. A synthesizer sugar coated sounds, a virtual grand piano for those classic chords and Vita 2 Sample Player form the instrument repertoire for your trap music. Develop your own strong basses, EDM synths, classical piano chords and acoustic drum sets in no time at all. Create new melodies and chords simply with your PC keyboard. Thanks to the arpeggio function in the screen keyboard, you'll play only the right notes. Draw notes, melodies, rhythms and chords using the MIDI tool. This is how you can easily "program" complex snare rolls and lightning fast hi-hat figures or complete beats. You can also use your MIDI controller to edit the timing and volume of your recordings. Connect your microphone to the PC and record your own vocal bits, singing or full rap parts. You can add creative filters and effects to the recordings after the fact. Effects in Music Maker are fast and easy to use. You don't have to spend time choosing, simply go ahead and drag & drop to see what works. Or you can work with your own settings yourself to get the right polish. Distort the sound of your vocals with audio effects like reverb, echo, wah-wah and flanger in styles such as "mask off". Turn up "Distortion" for your vocals, drums or brass elements. With guitar and bass amplifier you can edit the sound design of your trap beats quickly and professionally. 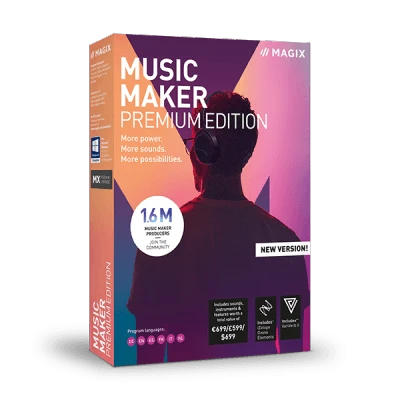 "Music Maker is a powerful DAW that can also be used by professionals." 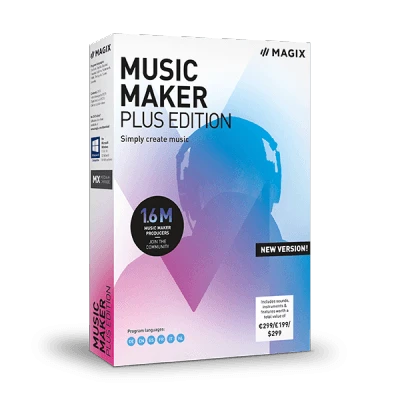 "There are many great products out there, but MAGIX Music Maker is just my thing." "I was drawn to Music Maker because of its simplicity and no-frills interface." "Easy to use, great value for money and impressive tools"
"A versitile toolkit at an unbeatable price!"